For many fans of contemporary dub-house, this is what dreams are made of. 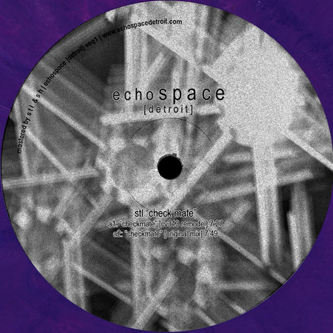 The latest Echospace features two original STL productions, backed with a CV313 remix, bringing together two like-minded analog auteurs for a feast of gaseous atmospherics and deeply pressurised rhythm minimalism. The centre-piece has to be STL's 'A Beautiful Mind', an expansive 17 minute track built in his intuitive and ultra-subtle style, working far into a groove that's long enough for DJs to go to the loo, read the paper, and still give enough time to make a heavy zoot. It's a bona fide epic! On the flip Hitchell, in his CV313 guise, tinkers with STL's 'Checkmate', lowering the bass levels to fill out the bottom end while making the hi-hats quiver with bespoke delay/reverb treatments, probably resulting in one of his most concentrated tracks to date. Stephan Laubner's original is a slightly more reclusive animal, content to hide behind swathes of static, wrapped in skyward dub chords and skanking merrily on a mammoth dub bassline. Truly exceptional stuff for any connoisseurs of dub-house - KILLER!